The visual method is used to detect apparent defects on the surface of the product being inspected. 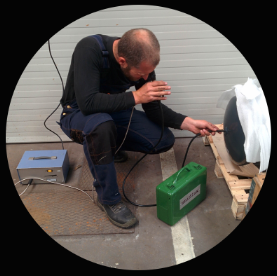 This method can be used for direct examination – visual inspection of all accessible surfaces of the material or product, and indirect testing – inspection of inaccessible surfaces in closed spaces, boreholes, etc., with the help of endoscopes. Visual testing concerns the detection and evaluation of surface defects using the human eye. Inspection can only be done without the aid of tools or with the help of simple aids such as a magnifying glass, a mirror, a variety of gauges or endoscopes, still cameras, video cameras, etc. The surface to be tested must always be sufficiently illuminated by daylight or artificial light.